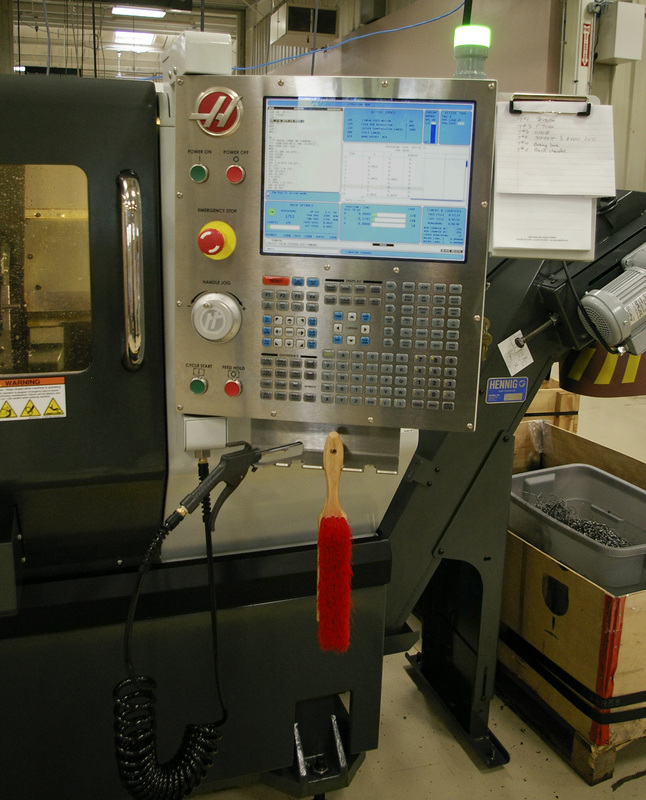 Forest City Gear’s blanking department now boasts a Haas ST-10 and two ST-20 Turning Centers. These machines were acquired recently to improve the throughput at Forest City Gear, a world leader in fine- and medium-pitch gear and spline work. The machines are used primarily for production of “donuts”, the near net blanks used in the company’s gearmaking operations. Roscoe, IL-Forest City Gear has acquired three Haas turning centers to improve the throughput at its gearmaking facility. The company has made this investment, according to President Wendy Young, “…because we needed to better control our throughput and reduce the time to start up jobs. We were experiencing some severe delays from outside vendors and we saw problems on the horizon from such bottlenecks. Our company is always on the lookout for such conditions, because both our quality and our delivery protocols are vital to our success with current and potential customers in the world market.” These new machines will be used in the company’s Blanking Department, headed by Tommy Kalt, who detailed the new machines. “We purchased a Haas ST-10 Turning Center with a magazine bar feeder, 300 PSI high-pressure coolant system and automatic tool presetter. It’s a fast, very flexible and very easy-to-use machine tool.” This machine, as well as two Haas ST-20 Turning Centers with 8” chuck and 20-station hybrid turret, fully programmable tailstock and high-pressure coolant pump, are currently operating in the Forest City Gear facility to produce “donuts” from automatically fed bar stock. These donuts are the near net shape blanks used in the gearmaking operation here. As a custom producer of extremely tight tolerance gears for the most demanding applications, according to company CEO Fred Young, “We need to have optimum control of our operation, at every step. Our company today exports gears to every corner of the world and our rigorous quality standards require a number of intermediate steps, prior to shipment. If the blanks are not available and our production is delayed, the entire operation slows and we simply will not allow that to happen,” Young stated emphatically. Kalt expands on the ST-10. “It has a manual, programmable tailstock for shaft work, another real advantage in our type of shop, where we do a lot of splines in addition to gears. Plus, the Haas CNC system is very easy to learn and to use. It has simple language commands and most operations can be done with the push of a button. I like to say it has an American-made feel to it. The work area is open, the tooling is easy to change and the learning curve was really short for our guys. They were up and making good parts almost immediately.” He noted that the performance of the first machine led quickly to the purchase of the two additional Haas ST-20 turning machines. 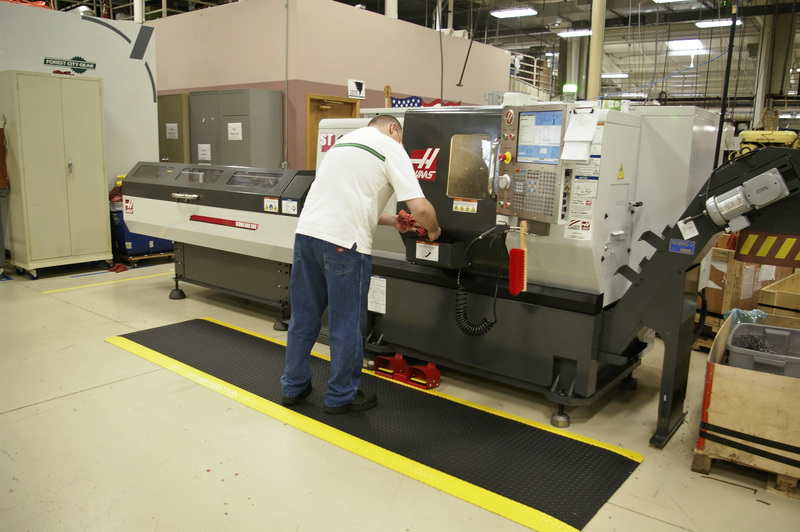 Kalt also cited the ECO CNC system on the Haas machines, with minimal lubrication requirements and auto-power down features were in sync with the Forest City Gear green initiative programs, as a further value to this purchase. 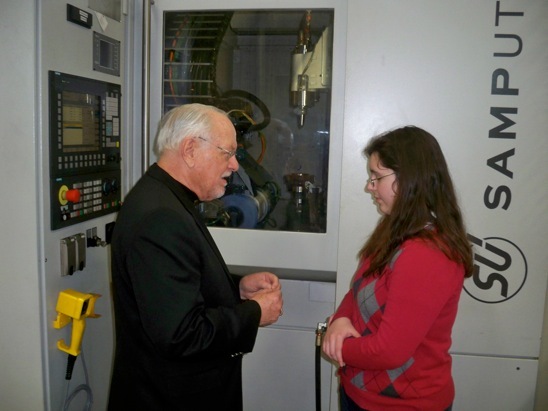 Accompanied by her grandfather, Brian Cluff, vice president of Star-SU, a major gearmaking machinery and tooling supplier, Alexi Cluff toured Forest City Gear to see the manufacturing world and discuss the options there for young women. Alexi, though only 13, is currently enrolled in an advanced engineering class at Northern Illinois University, designed to encourage more young women to explore engineering and science as a career. Roscoe, IL-Forest City Gear frequently opens its doors to visitors, usually from customer and prospect companies, as well as international trade associations, the media, vendors and occasionally competitors. Company owners Fred and Wendy Young have always believed this policy was beneficial to the visitors, who see some of the industry’s finest gearwork, produced and validated for quality on absolute state-of-the-technology, world-class equipment. Alexi is not your typical 13-year-old. She is currently enrolled in a program sponsored by a grant from the Motorola Foundation and conducted at the College of Engineering and Engineering Technology at Northern Illinois University. The program is a workshop in partnership with NIU-Enhanced Engineering Pathways, the Society of Women Engineers and the Girl Scouts of Northern Illinois. The stated objective of the program is to challenge and sharpen the skills of accelerated learning for 12- and 13-year-old girls selected by their local middle school science and math teachers. Currently, 48 girls work in small groups, assisted and taught by NIU women engineering professors and women engineers from various industries. These instructors mentor the girls on various engineering projects, from the building of simple electrical circuits to create sound, motion and light, to bridge building, chemical engineering and lean manufacturing simulation. The groups meet on Saturday mornings on the NIU Napervillie (IL) campus and also attend a summer camp, held each June. Forest City Gear President Wendy Young conducts the tour through the plant, showing Alexi Cluff the many types of machines used to produce and validate quality on the company’s high-precision gearwork. Often, the groups or individual students have tours arranged for them at local area manufacturing locations such as electronics and communications giant Motorola, where they can absorb “real world” experiences and especially meet women of all ages who have succeeded in the various disciplines required in a manufacturing environment. Since Alexi’s grandfather had a long working relationship with Forest City Gear, he reached out to Fred and Wendy Young to arrange a tour. The Young’s obliged, giving the young lady a complete tour of their factory and quality lab, plus arranging a roundtable discussion with a number of the women at the company, who perform all categories of activity for Forest City Gear. A world leader in precision gear manufacturing, Forest City Gear has an international reputation for “excellence without exception,” which happens to be the motto of the company. 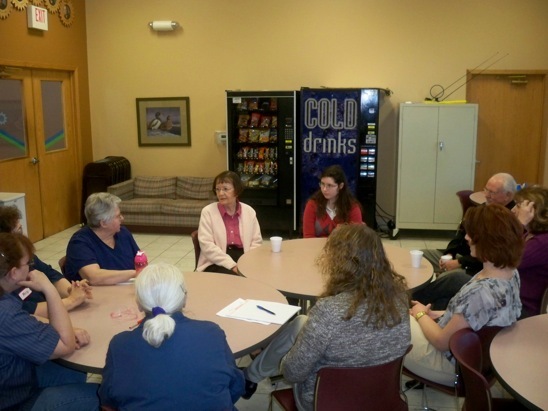 Women from all departments of the company, including application engineering, human resources, gear grinding, gear deburring, gear hobbing, order processing, estimating, expediting, procurement, materials inspection, quality validation, machine set-up and company management were at the table. Alexi’s eyes and ears were wide open, as she listened attentively to every word. Seated at the table for Forest City Gear, in addition to Wendy Young, president, were Kika Young, Geneva Parr, Mary McClellan, Krista King, Sharyl Stewart, Lori Lovett and Ingrid West. These women are involved in literally every aspect of the company. As Mary McClellan mentioned, “We touch the products at every step of the process, especially me (in gear deburring), because of my little fingers!” These women were unanimous in their advice to Alexi Cluff. “Always be willing to learn more, never be afraid to speak up with your ideas, bring all your skills to the job, every day, and don’t hesitate for ask for directions…something men never do!” They all had a good laugh. Alexi said, “I’ve always been interested in making things and finding out how they work,” a sentiment her grandfather echoed. “I started making gears when I was 14 and it’s fascinated me, ever since.” If there’s anything to that old adage about the genes skipping a generation, perhaps the gear industry will have another Cluff in its future! Forest City Gear CEO Fred Young explains some of the company’s gear successes to Alexi Cluff at the company’s display showcase. 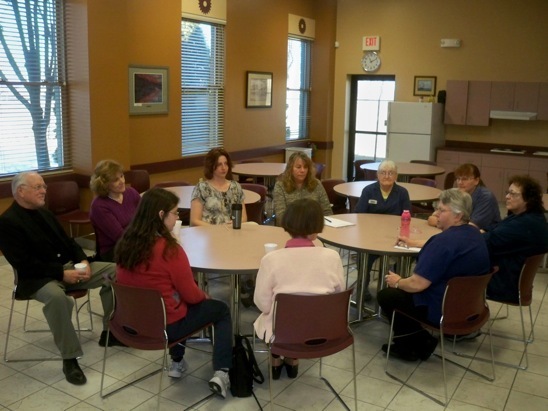 At this roundtable discussion, Alexi Cluff listened as women from every department of Forest City Gear spoke of their roles at the company and the many opportunities for women in the traditional “man’s world” of manufacturing. Many of these women are the lead or key individual in their respective departments at the company. In reviewing the NIU program and the comments above, perhaps it’s possible Alexi Cluff actually IS your typical 13-year-old girl. They just need to be shown their options. d, with successes ranging from the Mars Rover to the BMW/Oracle, winner of the America’s Cup. Brian Cluff and his longtime colleague and partner, David Goodfellow, manage and operate Star SU LLC, located in Hoffman Estates, IL. The company sells various leading brands of gearmaking machinery, other machine tools and a proprietary line of cutting tools. FOREST CITY GEAR PURCHASES NEW TAKISAWA LATHE…SEEING DOUBLE! Takisawa TT-200G, a twin-spindle, twin-turret turning center, purchased by Forest City Gear, has made dramatic improvement in this gearmaker’s blanking production. Roscoe, IL-Forest City Gear has purchased a Takisawa TT-200G, a fully-automated turning center with twin-spindle, twin-turret and twin-CNC operation, for its in-house blanking department. By the acquisition of this machine, according to a company spokesman, the production in the blanking department has radically improved, as the machine combines full automation with twin-sided, simultaneous machining. With a 16-pallet capacity, this Takisawa 8” chuck type machine boasts a feed rate of 8m/min and features a standard spindle and turret plus a second C-axis spindle and turret with milling function. In addition, a bar loader, workpiece stacker, turnover unit, chip conveyor, air blower, tabulating counter and other equipment are onboard for fully automatic mode operation of the machine. This sale was made for Takisawa by Brad Fischbach of Yamazen. Forest City Gear is a world-class supplier of high-precision gears for demanding applications in the aircraft, aerospace, defense, instrument, medical, racing (boat and auto), high-end sporting goods and other markets. The company sells its products worldwide, including to China. Forest City Gear was founded in 1955 by Stetler and Evelyn Young, parents of the current CEO, Fred Young, and is considered among the premier gearmakers in the world. FOREST CITY GEAR CO., INC.
Forest City Gear proudly announces the availability of its new capabilities brochure. This new literature details the many markets for which the company produces highly-specialized, custom gears to suit the most demanding applications for accuracy, stability and wear. A world-class gearmaker, Forest City Gear has a reputation in the international market for “excellent without exception,” the mantra of company CEO, Fred Young. Forest City Gear produces precision gears for a variety of markets, most notably aircraft, aerospace, defense, instruments, medical, racing (boat and auto), high-end sporting goods and more. The company’s products are found on the Space Shuttle, every car in the starting field at the Indy 500, the world’s longest distance casting reel, highly sophisticated measuring instruments and Siemens magnetic resonance imaging (MRI) machines, as well as Howitzer’s, surface-to-air missiles and other military ordnance. The company proudly boasts it will have every wheel and actuator gear on Curiosity, the next generation Mars Rover vehicle. That achievement was based on its outstanding performance on Spirit and Opportunity, the current vehicles occupying the Red Planet. The full brochure is available online at www.forestcitygear.com, which also details the company in a virtual tour of the facility, plus videos and a full personnel directory of key contacts.